Beauty with embellishment is empowering over wisdom and knowledge. Piercing has become an art of self expression. The trend is so fluently followed that the awareness of health risks is overseen. 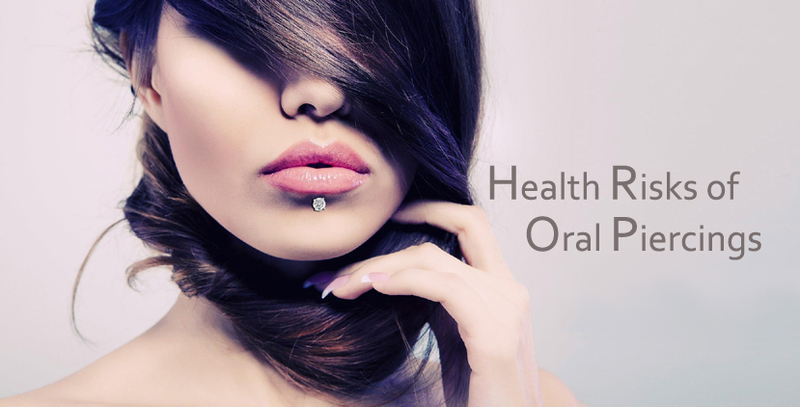 Oral piercing involves tongue, cheeks, and lips or a combination of these sites, resulting in adverse systemic and oral conditions. People, who get oral piercing, generally undergo the procedure without anesthetic. The piercing that starts from a lip or tongue can take the side effects from one part to the entire mouth-this include teeth which form the major fashion statement for a smile on cosmetic dentistry. Mouth Infection- Mouth is an open source of bacteria. Millions of these bacteria are live in our mouth that can lead to an infection after piercing. Even if these jewelry pieces in the mouth are touched and replaced, the chances of getting an infection increase. Prolonged bleeding- If somehow the needle punctures a blood vessel, the results can be serious blood loss and uncontrolled bleeding. Pain and Swelling- For any infection pain and swelling can be the most obvious symptoms. In case of oral piercing, sometimes severely swollen tongue can actually close the airways, causing difficulty in breathing. Chipped teeth- Continuous contact of oral jewelry with teeth can fracture it. Teeth with restorations as caps and crowns are easily damaged. Gum Injuries- Metal has the tendency of injuring gum tissues and can also cause gums to recede. Recessed gums not look unattractive but also deprive you from smiling, leaving your root vulnerable to decaying and periodontal disease. So in such cases where visiting your dentist was the most difficult task for you, you’re often visiting to get your mouth back with good health. Inference with Other Oral Infection- Jewelry in mouth can result in more excretion of saliva in mouth; excess saliva can impede your ability of pronouncing words correctly and difficulty in chewing and swallowing food. Blood Bone Disease- Oral piercing has been researched on for being a possible reason for transferring hepatitis B, C, D and G.
Endocarditis- An inflammation of heart tissues or valves, caused by a bacteria that has chances of entering blood stream from where it can easily travel to the heart. Unfortunately, for many people such ornaments for mouth and associated areas offer nothing more than attraction. Yet, oral piercing comes with alarming side effects that can only cause adverse effects to the mouth but also hot other body parts as well. Oral health is the key to keeping your teeth in good shape and keeping your smile alive. Cosmetic dentistry has advanced and can cure almost any issue of your teeth and gums, but that does not mean that improper care should be the choice. Dr. Jordan Balvich at Rensselaer Dentist creates beautiful smiles, providing dental consultations for both families and cosmetic concerns. It’s recommended that you take proper dental care to keep your oral health in good form. This is the first things anyone notices on you and this is what boosts your confidence. Brush your teeth twice a day along with regular flosses. Keep any ornament or jewelry away from your mouth, you want healthier teeth and a brighter smile. Severe infections of the teeth and gum can become chronic disease for the other organs. From mouth you’re taking an open source of bacteria’s, which sometimes have the bad kinds in majority. Take good oral care and let your smile act as a fashion statement.